For three years we'd been wanting to replace our Chevy Suburban (Big Red) with a newer truck. After all, Big Red was born in 2002, and had well over 100,000 miles on him (her?). If we were going to move to the cabin and subsequently pull an RV around the country, we knew we needed a new truck. But, we could not find an adequate replacement. We had hoped to get a new Suburban because of our loyalty to Chevrolet and the great experience we'd had with a long string of Suburbans and Tahoes over the years. But, Chevrolet had completely screwed up the cargo area several years ago. We need a large cargo area where the seats can either be removed (like in Big Red), or folded flat. Flat and level. Turns out, while you could get the cargo area in new Suburbans relatively flat, the surface was certainly not level. This is not good at all for the dogs because they'd slide to the back of the their crates. I can't imagine it works for other cargo either including groceries and other supplies. Stuff would just slide to the back of the truck. Really dumb. I guess since 2002, the Suburban was no longer considered a working truck but rather a soccer mom / big family transport vehicle and the size and weight and 4WD was all just show. We heard rumors that the 2015 model would fix the cargo area fiasco. So, we waited. So, we looked around at Toyota (Sequoia), Nissan (Armada), and Ford (Expedition). The Toyota was ruled out, even though it had an adequate cargo area design because it seems very big and not very responsive. After all, this would be the car Lynne often used for shopping and running errands up till the time we move. We ruled out the Ford because of the way the second row seats folded. We liked the Armada and were on the verge of buying one when we discovered that the Ford Expedition second row seats did fold flat and level! And, after a couple of test drives at Leo Kaytes Ford in Warwick, New York, we were sold. However, Lynne had the brilliant idea to trade in our Subaru Tribeca (Becky) instead of Big Red. That way, we could use Big Red as our "beater" truck at the cabin. I was planning to buy an old used Jeep Wrangler to use for 4WD, fishing, and to put a plow on it for winter. But, if we kept Big Red, he (she?) could fill that role and we would not need to buy a vehicle. Brilliant. 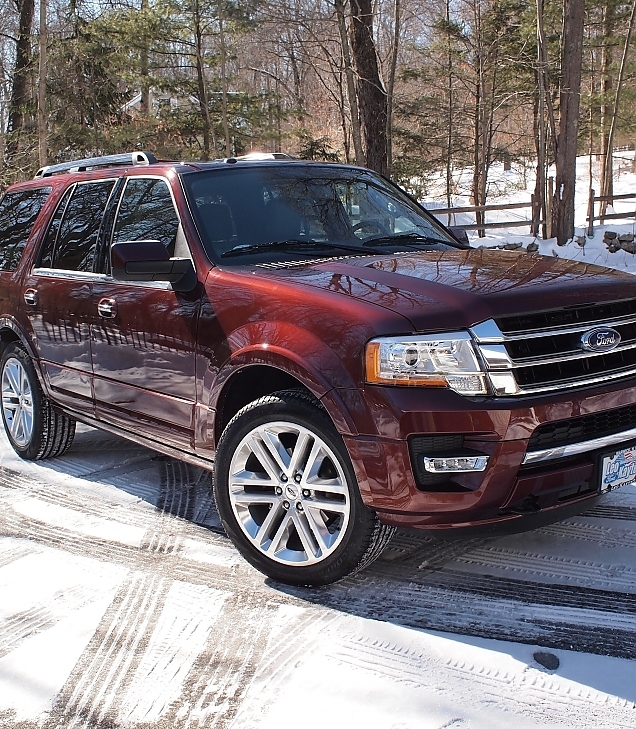 So, we said goodbye to Becky (she was an annoying car, but to be fair, a very reliable one) and bought a 2015 Ford Expedition. With all the bells and whistles. Next challenge. 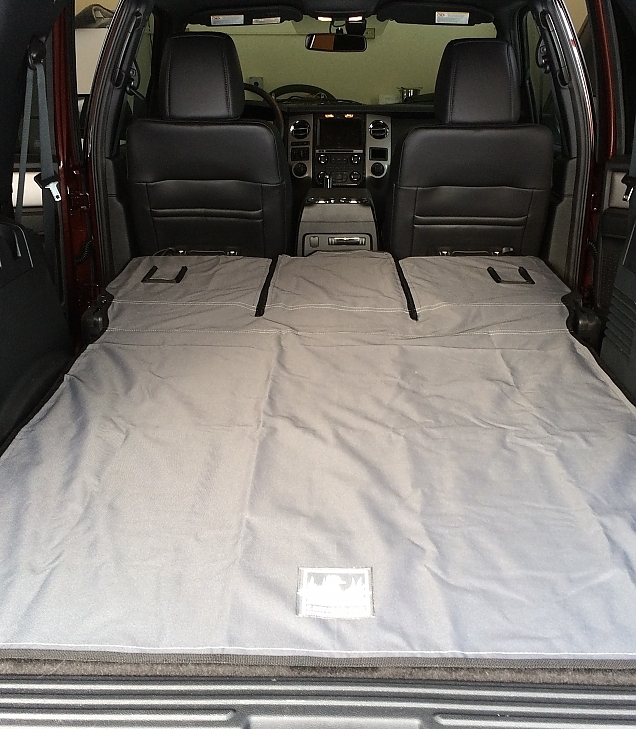 We like to line the cargo area with a canvas liner to protect the carpeting and seat backs. And, we've always bought our liners from Canvasback. But, they did not have what we needed. We needed a liner that would protect the entire cargo area with the 3rd seat folded down. (We never used the 3rd row seat in the Suburban and likely won't in this truck either.) And, with the 2nd row seats either up or down. I talked with the people at Canvasback and they were willing to make a custom liner. I did the measurements, drew up a proposed pattern, and sent it to them. For $159 they made a beautiful custom liner. Now that it is installed, I'd make one change to the pattern (and I've told them this in case I need to replace this some day), making it easier to raise and lower the 2nd row seats. If you need a liner for the cargo area in your car or truck, get it from these guys. They are great! While I was at it, I replaced the old, dirty liner in the Suburban. So, now we have two large 4WD SUVs. But, I must say that the Ecoboost V6 engine on the Ford is getting good gas mileage. And, it will do very well towing Lady Bug, and any subsequent RV we choose. We've taken another step on our way to life at the cabin! Oh, and we've named the Expedition Lex and it is definitely a guy!